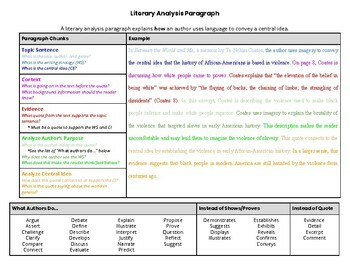 This outline and graphic organizer breaks down literary analysis for students so that they can clearly analyze an author's use of writing strategies in a text. Along with a paragraph on central idea, a literary analysis paragraph following this structure virtually guarantees students mastery on ELA Common Core Regents Text Analysis responses! This resource also includes a word bank for verbs detailing what author "do" as well as alternates for the commonly-used analysis words "proves" and "shows."